Sage Kashyapa had two wives named Kadru and Vinita. Kadru gave birth to thousand snakes who are considered to be the ancestors of the Snakes on earth. Vinita gave birth to the powerful Garuda. Once Kadru and Vinita put a bet on the color of the tail of the horse Uchaishravas, a seven headed flying horse that was obtained during the churning of ocean or Samudra Manthan. Kadru(mother of the snakes/serpents) claimed the color was black and Vinita (mother of powerful Garuda) claimed it was white. The stake was whoever lost the bet will serve the other. Kadru cheated by asking her sons, the Nagas, to hang on to the tail of Uchaishravas. Thus the white tail of the divine horse turned black as the nagas hung on to them. Vinita and Garuda were thus forced to serve Kadru. They were treated badly by Kadru and her sons. Later the nagas agreed to free Garuda and his mother if he brought the Amrit, or Elixer /Ambrosia which was in the possession of Indra, the king of Devas or demigods. 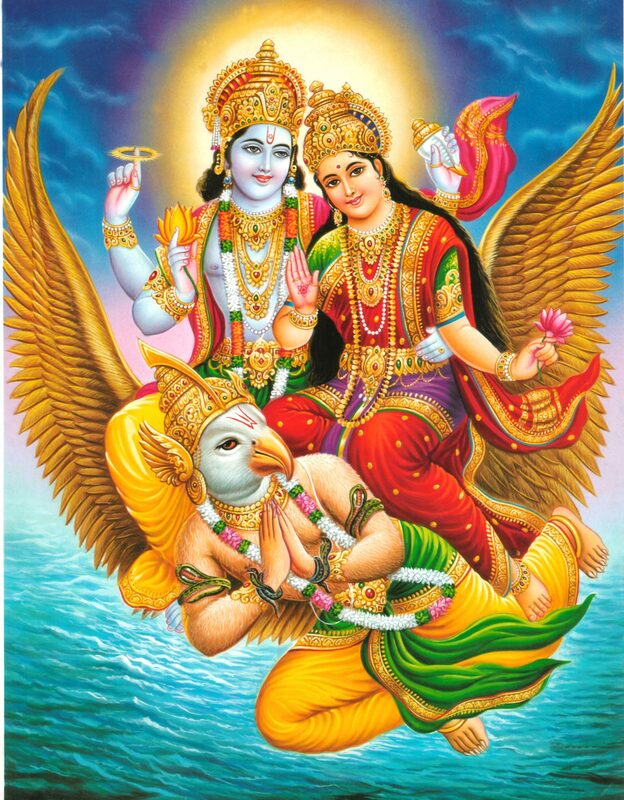 Garuda got Amrit from heaven and freed himself and his mother from servitude. But the cheating and the insult suffered made Garuda- the Eagle God the arch rival of Nagas. When Garuda stole the pot of Nectar/ambrosia from Indra, who was jealous of the Mighty birds strength, Vishnu was impressed with Garuda integrity as he did not take even a drop of the tempting nectar for himself and asked Garuda to ask a boon. Garuda immediately said that he wanted a position higher than Vishnu. Vishnu the eternal trickster that he was, asked Garuda to adorn his flag and sit atop the flagstaff. 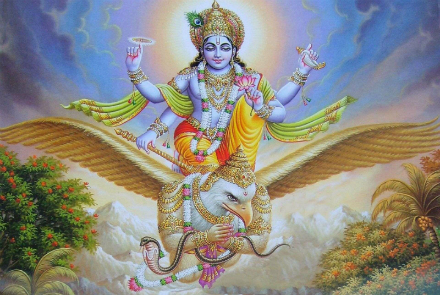 Garuda was so taken over by the Bhakti of the great Lord Vishnu that he promised to be his mount or Vahana. Nag Panchami is one of the most important Hindu festival held during the holy month of Shravan and is celebrated by millions of Hindus worldwide. Nag Panchami is the holy day to worship snakes or Nag Devta. Naga Panchami day is also referred to as Garuda Panchami. 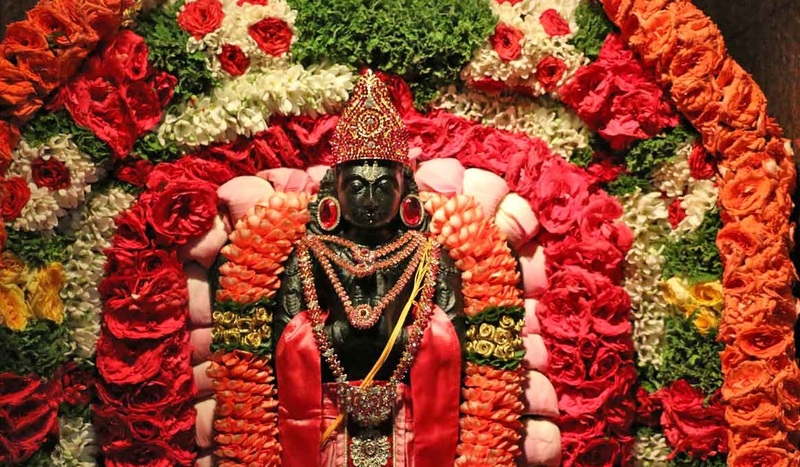 On this day Lord Garuda is also worshiped along with the Naga devata.